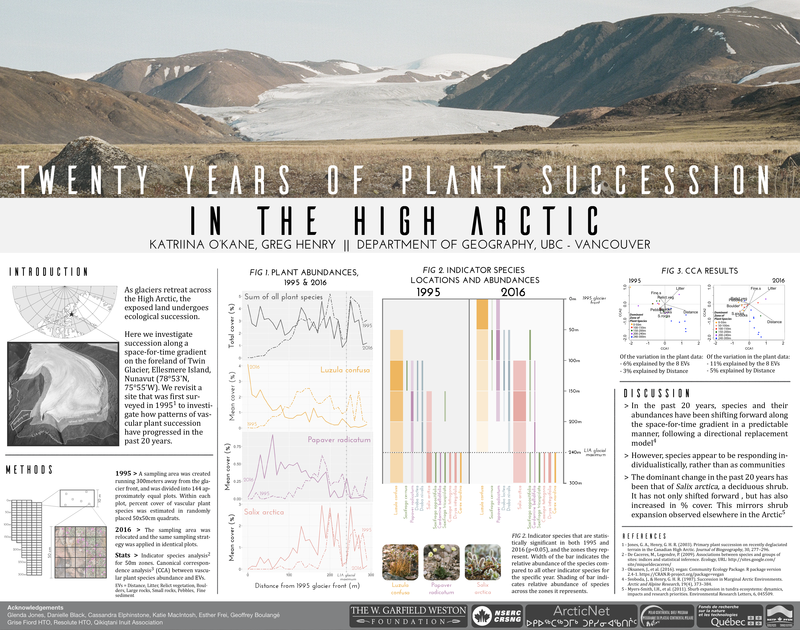 For my master's project I studied plant succession in the high Arctic. Succession is an important concept in ecology, as it deals with understanding how species invade barren or disturbed landscapes. How plants start growing on land where there is nothing but rocks, and how the ecosystem eventually (after hundreds or thousands of years) develops into a forest. It is this process of change over time that provides us with the clean air and water, and the fertile soils that we need to survive. To study high Arctic succession, I spent 10 weeks in the summer of 2016 on Ellesmere Island, 3km up from the base camp along Alexandra Fiord, on the bare land in front of Twin Glacier (mostly). Here I conducted vegetation surveys and used aerial photography to survey the land that has been released by the melting glacier. This is helping me learn more about primary succession, ie. how plant colonize barren land. I also spent some time closer to camp at an old research site where they use to grow potatoes in the 1980s. The farming experiment was abandoned in 1985, and the soil that was disturbed has since been recovering. Here I investigated secondary succession, ie. how plant regrow in areas where there is a bit of plant material left after the disturbance. Click here to see the poster from the project. And here for the thesis. Bio-diverse, healthy ecosystems are essential for our well-being, as they provide us with a range of ecosystem services (ESs), such as climate regulation and food production. However, linkages between biodiversity, ESs, landscape composition, and configuration of land use remain poorly understood. My project investigates the effects of forest fragmentation patterns (size and isolation of forest fragments in an agricultural landscape) on N cycling in forest soils. N cycling is a key biogeochemical cycle, owing to its importance in plant growth, and thus supporting the ESs provided by these plants. In this project, we sampled 24 forest fragments, capturing patterns of small versus large and connected versus isolated patches. We sampled 30cm cores within 10x10m plots, along two transects entering from the SW and NW edges of the forest fragments, where edge effects are expected to be most and least pronounced, respectively. This fall, I will continue the project by conducting laboratory analyses to measure N availability, through looking at rates of net mineralization, total % N, and pH in soils. This work is part of a broader initiative investigating the effect of forest fragmentation on biodiversity and ecosystem services. In this research we investigate spatial complexity in growth patterns of Picea glauca (white spruce) around Kluane in SW Yukon. Assumptions of regional homogeneity are often made with research and legislation surrounding protected areas, where smaller scale sensitivities are often not considered. To test if such sensitivities were important, we studied differences in tree growth across three sites, and determined which climatic variables most strongly influenced growth at each site. The three sites chosen were Burwash Quill (BQ), a cold subalpine site, Cultus Grasslands (CG), a dry forest-grassland ecotone, and Alsek Valley (AV), a wind- scoured slope. Our analysis was conducted using ring-width dendroclimatology, and backed up by δ13C isotope analysis. Our results show that indeed, small scale sensitivities are important. In ring-width analysis, we found significant differences in tree growth between BQ and the other two sites, although AV and CG display similar growth patterns. We also found that correlations between BQ and the other two sites declined over time, which could indicate a threshold being breeched, or be evidence of the divergence problem at BQ. Isotope results show poor correlations between all three sites, and further confirm spatial heterogeneity. To determine which climate variables were important at each site, we correlated ring-widths and isotope values to climate records in the area. We found that the dominant climatic controls were winter and spring temperature at BQ, and previous year growing season precipitation at both CG and AV. Winter and spring temperatures correlated negatively to BQ ring-widths, which suggests that trees grow more when winters are colder. Previous year growing season precipitation correlated positively to ring-widths at both CG and AV, which suggests moisture stress at these sites. From our results, it is clear that decision makers and researchers should consider smaller scale differences in landscapes when discussing how change, particularly climate change, will impact an area. Click here for full thesis. In this project we investigate the abrupt transition in sediment pigmentation and structure observed in a 29.4cm core taken from a shallow oligatrophic lake on Melville Island, NWT. We subject the core to several analyses to investigate the mechanisms that may have caused observed transitions and the timing of such shifts. These analyses include visual, lead-210 dating, thin section, grain size, chlorophyll a, carbon content (TC, TOC, TIC, and C/N), and isotope (δ13C and δ18O). Our results show dramatic changes from the older grey massive, to the more recent rust coloured, intermittently laminated sediments. Here, we propose an entirely new mechanism for this shift. We suggest a subsurface seepage model, whereby underground flow paths are opened up due to increased permafrost thaw, and deliver a sludge of water, gas, and ions to the lake bottom through “mud-volcanoes”. We suggest this occurred during the Medieval Warm period, and then proceeded to shut off again with the initiation of the Little Ice Age. However, these flows caused permanent changes in the lake environment, which persisted even after the pathways refroze. Further research is required to confirm our proposed mechanism, but nevertheless it calls to attention a previously unexplored method of change. Click here for the full thesis.